The classic overdrive with an active booster. It's quite a popular combination among guitarists. And it has many benefits. 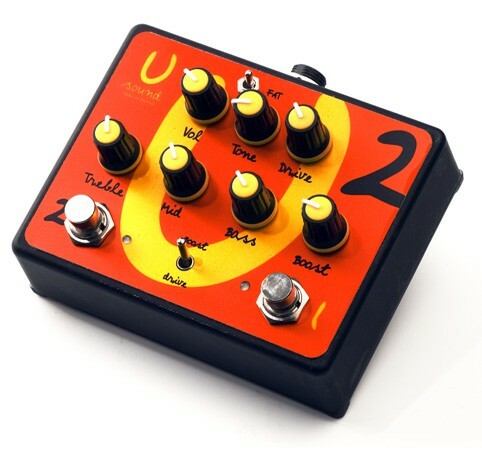 But the gimmick of this very pedal is the function that would be impossible when using two separate effects. It's the option of the following order. The first mode is when the booster is first and acts as the "heater" with a flexible timbre adjustment. The second mode is when the booster is preceded by overdrive. In this case the overdrive tone can be amplified and corrected (in frequencies) by the active booster. 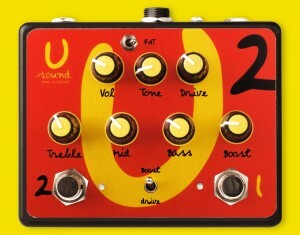 The unit can be used as the preamp. The two effects can function combined and separately. The pedal is assembled with the highest quality components. It has a transparent, clear and noiseless sound. Compact and convenient. U2 is powered with a stabilized adapter (9V). True Bypass.